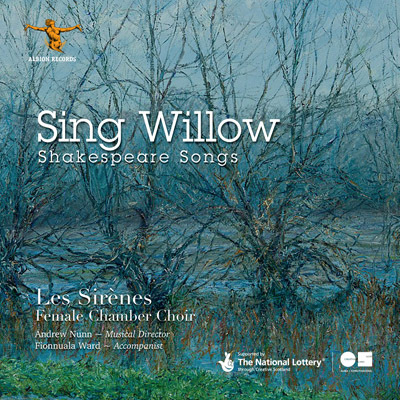 Sing Willow is a celebration, pairing some of Shakespeare’s finest texts with settings by the best choral composers of present and recent times in a recording where every song is a world première. This combination has produced a recording that is exciting and fresh, bringing new life and perspective to these stunning texts. The choir of 31 students and graduates of the Royal Conservatoire of Scotland, sings less than 10 minutes of music by Vaughan Williams, and all of that in arrangement. Those ten minutes are, it should be noted, quite marvelous, and the arrangements for women’s voices by Douglas Guest and William Pasfield suit the music perfectly. Central to the program are two collections, for one of which it is barely creditable that it is only now receiving first recording. That is a 1998 compilation of upper-voice settings, several written for specific boy choirs, by the dean of British choir masters, David Willcocks. They are as marvelously endearing as the man reportedly was himself. The other is a more recent publication (2015) by Bob Chilcott, entitled collectively Hark, Hark the Lark, and commissioned to celebrate the 400th anniversary of Shakespeare’s death. Andrew Nunn’s program notes are as lucid and stylish as is his conducting. In all, this release is a delight for the ear and for the heart and is warmly recommended.